An injury has the power to affect every aspect of your life — your mobility, your livelihood, your happiness, and even daily care needs. If you or your family member has been hurt in an accident, there is no better way to protect yourself from further damage than consulting an attorney who cares about your recovery. Our boutique personal injury law firm allows us to give our clients the meaningful personal attention and customized legal services they deserve while still offering the quality resources available at alarge firm. We routinely collaborate with some of the top medical, biomechanical and business experts around the country. Mr. Zappitell and his attorneys have represented me, my family and my friends successfully in a number of personal injury cases over the years. Mr. Zappitell and his attorneys have represented me, my family and my friends successfully in a number of personal injury cases over the years. He has won them all. If you'd like to win your case and obtain the fairest possible settlement, I would recommend him strongly. He's as sharp as they come. He also has a smart and talented team behind him. I have known David Zappitell for 14 years and have seen him in action. He is, without question, one of the best trial lawyers in the State of Florida. Hands down. He is caring, worthy, articulate, and overall amazing. He cares, yet is stern and gets the money I deserved for my accident. He doesn't even take money from you in anyway unless he makes you money. That is the way the world should operate, for you not for them! I know first hand how it feels to be taken care of by a true professional, since having David. Thank you David for being the best lawyer I could ever ask for! I was recommended to him by a friend and I was so impressed with his compassion and honesty. I called David Zappitell for some advice. I was recommended to him by a friend and I was so impressed with his compassion and honesty. This is one really nice man. I can only imagine what a great lawyer he is! Thank You David for taking the time to talk to me. Wishing you all the best. David is a brilliant lawyer and a compassionate person of the highest integrity. David is a brilliant lawyer and a compassionate person of the highest integrity. Proud to say I know him. If you’d like to win your case and obtain the fairest possible settlement, I would recommend him strongly. 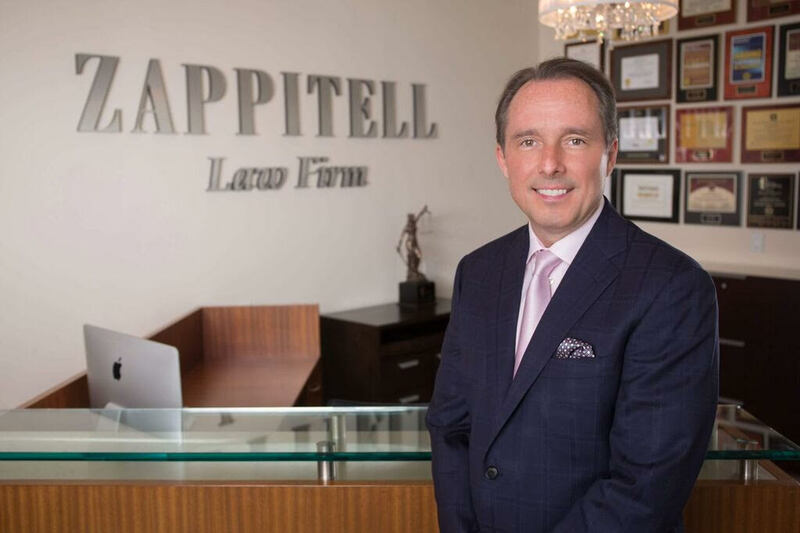 Mr. Zappitell has represented me, my family and my friends successfully in a number of personal injury cases over the years. He has won them all. If you'd like to win your case and obtain the fairest possible settlement, I would recommend him strongly. He's as sharp as they come. He also has a smart and talented team behind him. Great Law Firm, Thanks David! Thank You David for taking the time to talk to me. David Zappitell and the Zappittell law firm are the best of the best. David Zappitell and the Zappittell law firm are the best of the best. They are experienced, passionate,, tough and determined to achieve the very best resolutions for their clients. They have the technical capabilities to handle challenging and sophisticated cases, and they provide the support their clients need through difficult times. They are the type of lawyers you would want to represent a family member and you know the people they represent are in good hands. I cannot say enough good things about David and the members of his firm, simply put, they are excellent litigators who do the very best for their clients. If you’re looking for great attorney, don’t go any further. Go to the Zappitell Law Firm. If you're looking for great attorney, don't go any further. Go to the Zappitell Law Firm. David helped me with a previous accident, then I met his colleague, attorney Gabe Zambrano. Gave was patient, knowledgeable and kind. He went through every detail. He answered all my questions and resolved all the issues. I was very pleased with him from the beginning till the end of my case. The Zappitell Law Firm is one of the nicest law firms I have ever been to. If you need an attorney post injury, run don’t walk to Zappitell Law Firm. Gabe and his team did a phenomenal job helping me after my car accident. They were helpful, informative, and the on the ball. They literally did everything for me as the medical bills began to rack up. Sure enough, they got the medical bills paid and I received a check for the accident. If you need an attorney post injury, run don't walk to Zappitell Law Firm. Speaking with David was probably the best experience I have ever had with an attorney. He met the perfect balance between listening to me, taking in everything I had to say, evaluating the situation, and telling me the truth and what expectations were realistic for my case. I find that more valuable than any other interaction with an attorney. David Zappitell and his team are the finest lawyers and staff you will ever have the pleasure of dealing with. David Zappitell and his team are the finest lawyers and staff you will ever have the pleasure of dealing with. They have helped me and helped several of my friends pursue and win their injury cases over the years. I would recommend them to anyone who is seeking justice for themselves or their loved ones after an accident.